HM: Is it true that you are descended from Revd. George Walker of Siege of Derry fame? BW: I am a co-lateral descendant—descended from a brother of his. My family had only vague ideas about the link but recently an uncle traced the connection. HM: What about more recent family history? BW: My father came from Belfast, my mother from Glasgow, although her family came originally from County Armagh. We lived in County Down. My father was first of all Church of Ireland rector at Saul and Inch, outside Downpatrick. He went there after the war. He had been an army chaplain and had landed in Normandy on D Day 1. To this day , however, he has hardly ever talked about his wartime experiences. He has always remained proud of his connections with Saul, where St Patrick had his first church. In our household St Patrick’s Day was always much more important than the Twelfth of July. HM: Did you spend all your childhood in Downpatrick? BW: No. We moved to Ballynahinch around 1953. The rectory was situated in the middle of the fields where the battle was fought in 1798, although I have to say that during my time in Ballynahinch I never heard of the battle. I think that this was partly because we were Church of Ireland. I later discovered that one of our Presbyterian neighbours had a famous ancestor ‘out’ in ‘98 but I didn’t know this at the time. I think it was also because, due to his own experience of war, my father had a strong aversion to any mention of battles or war. Later on he became rector of Knockbreda parish on the outskirts of south Belfast. The church itself is a beautiful Richard Cassels building of 1737. HM: What about your schooling? BW: I first attended Magheradroll national school in Ballynahinch and then went to boarding school at Cabin Hill and Campbell College in east Belfast. There wasn’t much Irish history taught at Campbell when I arrived but in my last couple of years a very unusual character, Liam Barbour, came to the school as the Presbyterian chaplain. He had a real passion about Irish history and he taught us the ‘Grattan’s Parliament’ course on the eighteenth century. After that I was very keen, not just to do history, but Irish history in particular. So I went first to Magee in Derry for two years and then to Trinity College, Dublin. Magee had an arrangement with Trinity where people did the first part of their degree in Derry and then completed it in Dublin. HM: Tell us about your time in Derry. BW: It was a very interesting time, 1966-68, to leave Belfast and go to live in Derry. I was there before the outbreak of the troubles, but also returned in 1969 and 1970. I took part in some early civil rights marches. This was a rather innocent age before militants in both unionist and republican camps managed to push society over the brink. I was in Derry before and after the fighting broke out following the Apprentice Boys parade on 12 August, 1969. I regret to say that at this crucial moment the civil rights movement, which had very effectively led and managed protest in Derry, collapsed and was unable to control the fighting which broke out. HM: How did you find Trinity? BW: I enjoyed it immensely. I studied politics under David Thornley and Basil Chubb. My main subject, however, was history and my lecturers included R.B. McDowell and Theo Moody. I obtained a degree called Modern History and Political Science. HM: And you stayed on at Trinity as a postgraduate? BW: Yes, I remained to do research on the late nineteenth century which really stemmed from work I had done with Theo Moody as an undergraduate. He ran a special subject on the Home Rule movement in the 1870s and 1880s. I went on to do a Ph.D on Ulster parliamentary politics in the period, 1868-1886. It was eventually published by the Ulster Historical Foundation as Ulster politics: the formative years, 1868-86 (1989). HM: Was Moody as influential as people now make him out? BW: Yes, he was. He was a very impressive character to look at or be in the company of. He was both a very honourable and generous person, and a totally dedicated scholar. He was influential in Irish history in so many ways, such as his co-founding and co-editorship of Irish Historical Studies, his establishment of the Thomas Davis series of radio lectures and his writing and editing of many important books. He taught me the basics of historical research. We had postgraduate seminars, under his chairmanship, where we each gave a paper. I found that he gave me very good advice at the right time. I made good friends whose company I still enjoy—Bill Vaughan, Roy Foster, Jacqueline Hill and Vincent Comerford were among my contemporaries at this time. HM: Then you went to work on the New History of Ireland project? BW: Yes, after my Ph.D, I got a research post with the New History of Ireland. Theo Moody was the driving force. 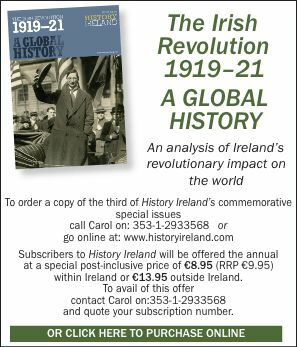 It has taken longer to complete than originally envisaged but, in my opinion, it has set an important benchmark at a particular time for the writing of Irish history. For a couple of years I worked on two ancillary volumes on election results in the nineteenth and twentieth centuries. HM: How did you get a job at the Department of Politics at Queen’s? BW: I had a succession of temporary jobs at Queens, Trinity, the Open University and Liverpool. Politics only comprised only a minor component of my original BA. However, a job came up in Queen’s politics department to replace John Whyte who was going away for a year. Naturally, I emphasised the political science part of my degree! In those days, in fact, many political scientists came from a history background. This job was eventually made permanent. I had to teach European and comparative politics and I found that this gave me valuable perspectives on Ireland. I now find the European setting the most important to understand Irish history and politics, far better than any narrow Irish or British Isles setting, or broader colonial or post-colonial frameworks. The professor, Cornelius O’Leary, proved a good boss who encouraged his staff to get on with their work and research. When I returned to Belfast permanently in the late 1970s I shared a house with the playwright Stewart Parker and his wife Kate and some friends. HM: One of your most interesting enterprises was to move into publishing local history, at a time when many publishers weren’t that interested. Did you feel like a pioneer? HM: I am particularly interested in Sentry Hill: an Ulster family and farm (1984). You were obviously very lucky to come across such a unique family history. BW: Yes, I was. When I visited Sentry Hill, home of the McKinney family near Carnmoney, East Antrim, I discovered a marvellous collection of original manuscripts, photographs, books, furniture and other material belonging to this one family. And the beauty of it was they were just an ordinary farming family. But they were typical of a group of people about whom we are not well informed. Various family members were great collectors and had an interest in local history so they kept things. In addition, the son of the family was killed at the Somme in 1916 and his sister kept the place largely unchanged from that day until I arrived sixty years later in 1976. Her cousin Joe Dundee, a remarkable country doctor with a great love of history and the countryside, moved to Sentry Hill in that year and he allowed me to research and write up my history of the family and farm. The house has now been bought by Newtownabbey Borough Council who are going to develop it as a sort of heritage centre. HM: And McKinney took the photographs himself? BW: Yes, he was an extraordinary photographer who simply photographed his own backyard. He photog– raphed his neighbours, friends and people working on his farm. So the photographs are really special. Many people in those days of the late 1890s and early 1900s photographed the Giant’s Causeway. They never dreamt of photographing their neighbours or the people working on their farms. What would you do that for? He did and his photographs, now in the Ulster Folk and Transport Museum, are probably the best single collection anywhere in Ireland for a farming community in this period. From that interest in books of photography and Sentry Hill, in particular, I decided that there was a need for a publisher with a specialist interest in local history, including early photographs. So I set up Friar’s Bush Press, run from my house, for approximately the decade 1986-96 and produced about sixty different volumes. HM: You later became Assistant Director, and in 1993, Director, of the Institute of Irish Studies at Queen’s. Can you tell us something about the background to the Institute? BW: The Institute was founded in 1965 by the pioneering geographer Estyn Evans. My immediate predecessor was Ronnie Buchanan who built up the profile and activities of the Institute to a very successful level. The aim is to promote research relating to all aspects of the study of Ireland—history, geography, language, literature or whatever. We have always retained that wide approach. We welcome senior visiting research fellows from outside Northern Ireland as well as young scholars, usually at post doctoral level, from anywhere. In addition we have set up a number of very interesting research projects, for which we have received outside funding. A good recent example has been the Ordnance Survey Memoirs which we have published in forty volumes. We claim to have been the first institute or centre of Irish Studies: there are quite a number of them now—in Britain, North America and Australia as well as the Continent. HM: How has the Institute developed during your time? BW: I have taken a special interest in our publishing wing which is now responsible for over 120 academic titles. We are involved in an exciting new project on the history of the book in Ireland, along with the Centre for Irish Literature and Bibliography at the University of Ulster, Coleraine. But the Institute is not some remote research centre removed from the community. We try to make a contribution to the public discourse on the issues affecting our society. We have people working on the contemporary situation. Dr Colin Irwin has conducted a number of important opinion polls on the development of the peace process. Dr Dominic Bryan has carried out valuable research into parading. The Institute has been home to a number of research fellows, funded by the Community Relations Council, working on various aspects of cultural traditions and diversity. HM: From time to time you have written myth-busting pieces like, most recently, Dancing to History’s Tune (1996). Isn’t such revisionism at odds with your other interest in cultural traditions in Northern Ireland? BW: I am interested in what history is commonly accepted by our community and why certain aspects of history are important and why others aren’t. So I explore these traditions. They are, very often, a popular way of remembering history. Now, I would not debunk such traditions and say they are of no value because they don’t accord with straight historical facts. I am interested in how people have come to take these attitudes and views, and why they are important to different generations in different ways. My most recent work has been on the Apprentice Boys of Derry. HM: What did you find out about them? BW: Much of the tradition they maintain today and which they would regard as sacrosanct and unchanging, has in fact evolved and changed over the years. This doesn’t mean that what they are doing today is artificial. It is very real for them and their world. Nonetheless, it is part of a changing tradition, an evolving tradition. We have got to be conscious of how these traditions have developed over time. On the one hand this encourages us to see the strength of them; on the other it also shows how they have considerable flexibility. I discovered that at the centenary celebrations for the siege in 1789 the Catholic clergy in Derry were involved in a parade to the Church of Ireland cathedral to celebrate a victory for liberty for all. By 1889 the siege was celebrated exclusively by Protestants, but nearly all from Derry. Involvement by Protestants from all over Northern Ireland only became significant from 1922 onwards. HM: Are you looking at any other traditions? BW: I have been looking at some of the popular celebrations over the years for the events and people of 1798, especially Wolfe Tone. Commemorations at Bodenstown in his memory only become major public events in the 1920s. Tone is well known today for his statement about ‘uniting Protestant, Catholic and Dissenter’, but in the 1920s and 1930s he was very rarely quoted on this. His writings were used to reinforce many points but not that one. HM: You have had a long-standing interest in the arts. I believe that as a schoolboy you saved up and bought a William Conor painting. So it must have been the fulfilment of an ambition to become Chairman of the Arts Council for Northern Ireland. BW: Yes. It is a very exciting and challenging job. I have had an interest in the arts, particularly paintings, going right back to my school days. I also enjoy the theatre and edited a book on Frank Matcham, the architect of the Belfast Opera House. One of my ambitions is to establish an art gallery for Belfast. We have wonderful collections here in Belfast—historical paintings in the Ulster Museum and contemporary paintings in the Arts Council. The Ulster Museum in particular has a marvellous collection of Sir John Lavery paintings. And yet there is no decent gallery to show them. I think one of our problems in Northern Ireland is that we have emphasised, quite rightly, our industrial and business heritage but we have sometimes under-estimated our artistic heritage. Yet so many of the best Irish painters of this century have come from the North. HM: Care to name any high points of your career to date? BW: That’s a difficult one. I was honoured to be invited by President Mary Robinson as one of her special guests at her speech on the Irish diaspora to the Oireachtas in 1995. I was also honoured to be asked by President Mary McAleese to give a speech, along with Brian Farrell of the Irish Arts Council, in Áras an Uachtaráin on 12 July 1999, on the subject of the Protestant contribution to the arts in Ireland. I was pleased to be asked by the education committee of the Orange Order to deliver an after dinner speech at parliament buildings at Stormont at an event to commemorate the 1798 Rebellion in June 1998, the day before the bicentenary of the battle of Ballynahinch. I ended by urging my audience to remember events in Ballynahinch, to recall those brave Catholic soldiers of the Monaghan militia who fought and died to save Ireland for the Crown and those gallant Presbyterian United Irishmen who fought and died for a new Ireland. Hiram Morgan is joint editor of History Ireland.